Oh, wow, I just really enjoyed reading this book! I mean, A Court of Wings and Ruin was one of my most anticipated book of 2017, and to have this book to follow it, to see how our favourite characters are doing, yeah, that was really great! These characters are scarred. There's trauma from what they went through, the choices they made, the people they lost. Which is true to life. You go through a hard experience, and you'll be changed. It was still not too easy to read! 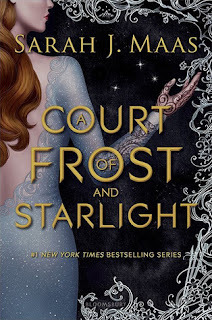 We were in more heads than just Feyre and Rhys, which was really awesome! There is so much potential for the future books that this books mentions a bit, but doesn't explore too deeply. That's what the next 3 books are for, I think! So excited! Through this book, there was healing, like Feyre having the building and teaching art to the kids. That's just great, and I'm glad that she has something positive in her life ! She's earned some happiness after everything that's happened! This book was so fantastic, and I enjoyed it, so, so, so much!